Is it me or is it really impossible to avoid hearing about this year’s record low temperatures, polar vortex, and diminishing time until frostbite on every news outlet in the nation? If their goal was to spread panic to the masses, consider their goal accomplished. It has certainly fueled my frantic quest to find durable and practical winter boots to defeat the cold. Fortunately, the ungodly number of hours I have spent scouring the internet has brought me 12 lovely winter boots to share. Dressed up or dressed down, these will fit in any lady’s stylish wardrobe. Bare Traps Kinship Boot: Love that classic riding boot style? You can continue to wear those riding boots even through the winter with this pair. They are waterproof and have a faux shearling lining. Sporto Women’s Nadia Riding Boots: Another classic riding boot to add to the collection, these boots also feature a faux terylene fur lining that will keep your toes warm and cozy. Bare Traps Saydo Faux-Shearling Boots: Of course, the more options, the better! Here is another classic riding boot style with faux shearling lining to dress up or dress down with your outfit of the day. Hush Puppies Rustique Bootie: Fancy a shorter boot? Well, these are the pair for you! These cute booties are made with waterproof leather and Thinsulate™ lining. UGG Irmah: Though on the pricier side of the spectrum, these boots will be worth every buck. They are made of waterproof leather with a sheepskin foot bed and fleece-like lining through the shaft. They also feature a wedge for those ladies who still want that height. Bare Traps Select Faux-Shearling Booties: Another option for those shorter and cute booties, these ones have a more rugged look with faux shearling lining.These next set of winter boots are perfect for a more casual style. Talia Hi 200 Waterproof: Casual with an almost sneaker look to them, these boots are waterproof with Thinsulate™ lining. LL Bean Women’s Bean Boots: Though, I am not a particular fan of the duck boots, these can be dressed in a cute fashion and will keep you warm throughout the winter. They are made of waterproof leather with rubber-chain tread bottoms to keep you from slipping in the snow. The North Face Women’s Snowtropolis Lace: With waterproof suede and leather, these stylish winter boots with a sweater knit cuff will rough through the toughest of the winter season. Though on the pricier side, it does come with a limited one year warranty! Women’s Timberland Authentics Waterproof Fold-Down Boot: These winter boots go along with Timberland’s usual rugged style to outlast any weather conditions with waterproof leather and suede, and terry fleece lining. UGG Belcloud: On the priciest end, these boots are the ultimate investment that will last you for several seasons of snow. They are a more disguised pair of duck boots with durable waterproof leather and warm, breathable lining. UGG Zea: For those ladies who love their heels, these are a great addition with a stylish sheepskin collar so you can strut in style through the winter weather. 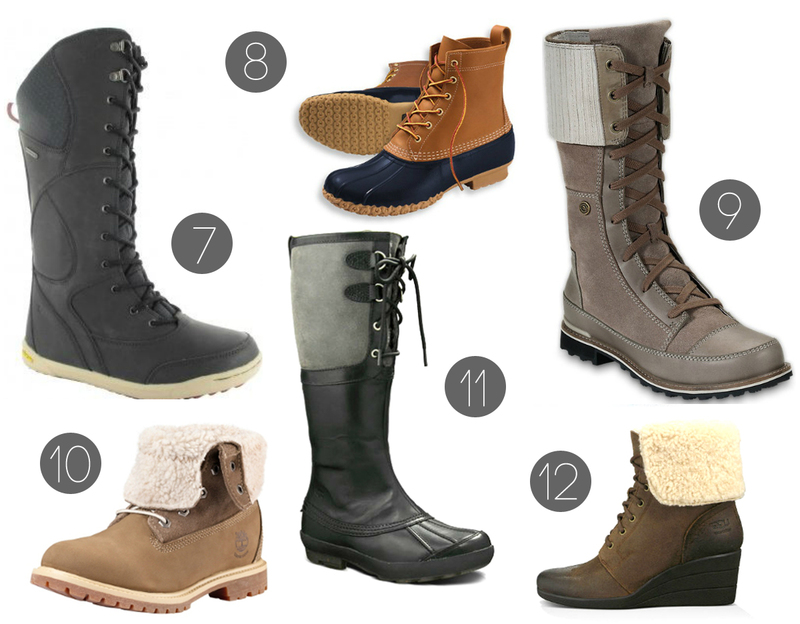 With these winter boots to add to your collection, there is something to look forward to with those cold temperatures. Hope one of them finds its way to your closet this season!